I had intentions of posting periodically to my blog and including photos along the way, but I failed miserably – mainly because I was really busy. Since the purpose of the trip was photography, I tailored everything accordingly. That meant getting up really early (often before sunrise) and shooting well after sunset – the best times for photos. The long days of summer sound great for a traveller, but I realized that for a photographer it means getting up at 5 (or earlier) and photographing till 10 at night. Often that was when I would have dinner and then go back to the hotel to crash before getting up the next morning. Luckily, I hit the ground running with no signs of jet lag – up till midnight on the first night and slept soundly till 7 the next morning. Also, for a traveller the weather wasn’t perfect – several days of storms or clouds; but for a photographer it was terrific, with lots of different lighting opportunities. I did a lot of research before I left, planning a very full and detailed itinerary, and I’m glad I did. I got a lot more done, and I could also rearrange things quickly on the fly when I needed to. When I first got the idea for this trip it was going to be an opportunity to cycle in some iconic locations, and to take photographs, in about equal measure. But as I planned it out, I realized that photography was taking prominence. In the end, I didn’t take my own bike, and instead rented a nice racing bike for a few days while in Tuscany. That was a great decision: I had three fantastic rides in some of the prettiest landscapes that exist, but for the rest of the time I could concentrate on the camera, without having the hassle of lugging the bike around. Looking back, I asked myself what was the highlight, and also the luckiest occurrence? Both were in Venice. I had researched that on one of the days I would be there the moon would be setting just before sunrise in the direction of San Marco Piazza, promising some interesting images. So I got up at 4:30 to catch it. 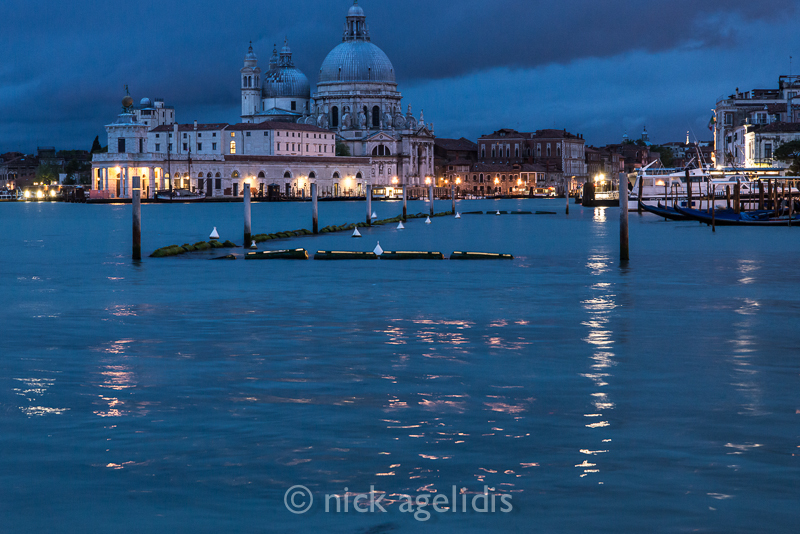 As it turned out, the moonset wasn’t all that impressive, but being in Venice when nobody else was around was amazing. Having all of San Marco or the Rialto Bridge to oneself was surreal, especially when a few hours later they would be absolutely packed. There were some early bird tourists out taking photos at 8, and I just wanted to go tell them that I was there three and a half hours earlier! Also during the two nights I was in Venice (and this I missed during my pre-trip research) there was a high tide, which flooded San Marco Piazza and surrounding areas. The minor inconvenience of having to remove shoes and socks to wade back to the hotel was more than compensated by some incredible photos. I’ll share lots more photos in future posts, but here are a few from Venice to get started. In retrospect, I’m not sure I would have changed much if I had the opportunity. If you’re really interested here’s how I spent the 17 days. Day 1: Arrive in Milan; drive to Bellagio; boat on Lake Como to Varenna and back; drive to Bergamo; night photos. Day 2: Morning photos in Bergamo; drive to Milan; afternoon/evening photos in Milan; back to Bergamo. Day 3: Drive to Verona; drive to Vicenza; see end of Giro d’Italia stage 21; drive to Padua. Day 4: Morning in Padua; drive to Venice. Day 6: Morning in Venice; drive to Ravenna; drive to Montepulciano. Day 7: Ride; drive to Montalcino for photos and dinner; back to Montepulciano. Day 8: Drive to Orvietto for photos and lunch; drive back to Montepulciano; ride. Day 9: Drive to Siena; late afternoon drive to San Gimignano. Day 10: Photos around countryside; ride; return bike to Siena; evening photos in Siena; back to San Gimignano. Day 11: Morning in San Gimignano; drive to Florence. Day 13: Morning in Florence; drive to Lucca. Day 14: Drive to La Spezia; train to Manarola (Cinque Terre); hiking. Day 15: Hiking and trains in Cinque Terre.